I'd love to have a sweater like that today, but back in 1949 what I was probably happy about was getting my picture taken, thereby being the center of attention. I'm sitting on the well at my grandparents' house in Calpella, California. That's my brother in silhouette down at the other end of the arbor. My grandfather built the house around 1915, and raised wine grapes on his ranch for about the next 40 years. He did really well during prohibition, but suffered when grape prices plunged after repeal, for which he held FDR personally responsible. He was a feisty Old Country Italian. View full size. Submitted by librarylady on Mon, 02/15/2010 - 1:33pm. She had a real cute pixie haircut in the fifties - and the pretty face that you needed to carry it off! Submitted by tterrace's sister on Sun, 02/14/2010 - 8:47pm. I have asked tt not to post images of me. There are a few on the site. Submitted by tterrace on Sat, 02/13/2010 - 7:18pm. 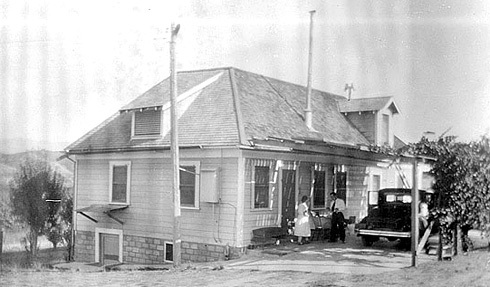 Here's a rear view of my grandfather's house taken about 1930. In the driveway are my grandmother, my father and his Chrysler. If it is 1930, it's two years before he was married. The house still stands and is occupied, but since the peaked roof was removed it's almost unrecognizable. The last time I went by, though, I could still see that doorway to the basement where Grandpa made his dago red. Sharp-eyed koley5 is right; the well photo was taken the same day as this one. My memories of the house are indeed happy: sitting around the kitchen filled with aromas of Grandma's cooking; Grandpa playing his accordion; the front room with all the nice furniture nobody ever went into; puking purple after spending a day roaming the vineyards stuffing my face with grapes. Submitted by Inky Knits on Sat, 02/13/2010 - 4:25pm. I may have just fallen into a sugar coma from all the sweetness in this photo. Really, tterrace, you must start posting a disclaimer before showing us such cuteness! Submitted by Anonymous Tipster on Sat, 02/13/2010 - 3:10pm. Just like someone said previously, I knew it was tterrace without reading any of the captions. It knew instantly who had posted it simply from that mischievous smile you see in a 6 decade long parade of photos. I even bet if there is a police mug shot of tterrace somewhere we all can identify him instantly as well. Submitted by Sarah T. on Sat, 02/13/2010 - 11:46am. Every visit to your gallery induces my own "remember when" and a smile. Thanks for sharing! Submitted by Anonymous Tipster on Sat, 02/13/2010 - 9:41am. I actually just said "aww" out loud. Submitted by Paladin on Sat, 02/13/2010 - 7:48am. "What's that, Lassie? tterrace fell down the well?!" Submitted by koley5 on Sat, 02/13/2010 - 7:47am. Same sweater as the one you were wearing in that pic with your brother on the steps at your grandparents'. On the same day? Submitted by Anonymous Tipster on Sat, 02/13/2010 - 7:20am. You don't suppose it was the Mafia buying those grapes, maybe? Surely there was no legal domestic production of wine during Prohibition. There's an extensive literature about smuggling hard liquor from other countries (in which the Mafia played a role), but not much about wine. Submitted by Anonymous Tipster on Sat, 02/13/2010 - 5:50am. Great photo! Your smile is just precious. After reading your comment, I would love to see some more photos of your grandparents' house if you wouldn't mind sharing. Submitted by loribl on Sat, 02/13/2010 - 1:55am. From what I can see, this looks like a great house. I would bet you loved going to your grandparents' house, right? BTW, what a great smile!